AP/Omar Vega/Invision for Jordan BrandRussell Westbrook. You don’t choose the size of your nose, the colour of your eyes, or the fullness of your brow (at least without the assistance of a plastic surgeon), but what you can do is accessorize those features with a great pair of glasses. Russell Westbrook, owner of a nice face to begin with, often opts to accent his features with colourful specs (see: here, here, and here). 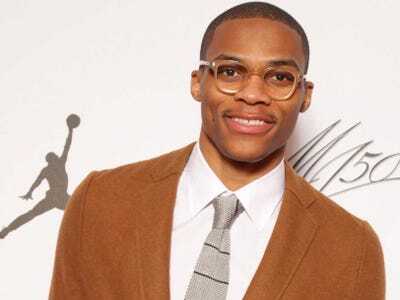 Taking his love affair with eyewear a step further, he recently launched his own line, Westbrook Fames, which has now partnered with JackThreads for a new line of shades, all coming in under $US100. For thoughts on how best to frame the windows of your soul, we hit up Westbrook for some specific helpful tips. OK, so how often should a man purchase new glasses? I like to get new glasses and sunglasses every time the season changes, but I think if you have one classic pair and one cool, swaggy pair then you will be set. When a dude puts on a pair of glasses and looks in the mirror, what should he look for? I think it’s important to see if they are straight on your face and if they fit your face. If you have a small face and the glasses are really big then it might not look right. Who do you ask for a second opinion when shopping for glasses? Ask a sales clerk, your friends, family, or even a random person walking in the store. I’ve done that plenty of times — just ask a complete stranger their opinion. You have a lot of colourful plastic glasses in your collection. Why? How do I know what colour is right for me? It’s important to have a variety. I like to wear different coloured frames based on what I’m wearing and what colours I have on. Plastic glasses are more affordable so people can own more frames in different colours. Have you ever lost a pair of glasses you loved? I was actually in a store trying on new glasses and I took off my pair and left them on the counter. I didn’t even get out of the store when I realised I forgot them but when I turned around they were gone. I think someone stole them and I was so mad! When is it ok to wear sunglasses inside and when is it not? It’s based on your own swag. If you feel comfortable wearing sunglasses inside then go for it!